A government initiative to reduce traffic chaos in the Indian capital, Delhi, by creating a special fast lane for bus users has run into a major controversy. The city's first experimental Bus Rapid Transit (BRT) corridor system allows bus users a smooth ride through traffic congestion, but it is facing legal challenge from a group which represents car users. The petition has also exposed the class divide in the Indian society. The Delhi High Court is to soon rule on the petition seeking to scrap the BRT corridor. The petitioners say that private car owners are suffering because of the preferential treatment given to public transport. "Car owners are the creators of wealth. Do you realise that they get exhausted sitting in their cars due to traffic jams and they reach office completely tired? It affects their efficiency. Do you want them to perform less?" asks the main petitioner BB Sharan. His NGO, Nyayabhoomi, has argued in the court that the system has slowed down the traffic and created problems for the people, "without any evident advantage to bus users". Car owners are the creators of wealth. They get exhausted sitting in their cars due to traffic jams and reach office completely tired. It affects their efficiency. But Geetam Tiwari, a road safety expert and professor at Delhi's Indian Institute of Technology (IIT), disagrees. She says the definition of "people" should include those who walk to work or use bicycles and buses. "The problem of car users, who are in a minority, is being portrayed in the press as the people's problem. The fact is that less than 10% people in Delhi use private cars. More than 33% travel by buses and 30% walk to work," she says. Prof Tiwari believes that the BRT is the only answer to Delhi's growing traffic problems, where 1,500 to 1,600 vehicles are registered daily. Government figures show that the number of private vehicles in Delhi has grown from 3.3 million in 2000-01 to nearly seven million in 2010-11. As the capital of one of the world's fastest growing economies, Delhi faces huge infrastructure challenges. Experts say one of the main reasons for the exponential rise in private vehicles in the city is a lack of adequate public transport network and acute shortage of comfortable buses for its over 16 million people. The Metro rail network, introduced in December 2002, has indeed taken some of the burden off the roads, but it is still a work in progress and does not cover large parts of the city. Prof Tiwari was part of the expert group which came up with the idea of the BRT in 1995. She told the BBC that the inspiration came from the Brazilian city of Curitiba which has had the bus rapid transit corridor since 1975. However, it took the Indian government more than a decade to finalise its urban transport policy which promised to allocate more road space to people rather than vehicles, which meant public transport would get priority over private cars. The initial plan to construct 14 such fast-track bus corridors in Delhi was put on hold after the 2008 decision to dedicate the first 5.8km (3.6-mile)-long stretch for buses created controversy. In the summer this year, the Delhi high court temporarily allowed private vehicles to use the bus corridor and ordered the government to assess the feasibility of the project. The Central Road Research Institute (CRRI), which conducted trial runs to record the difference in traffic flow, in its 203-page report concluded that the corridor was "impractical" and its "faulty design" was causing traffic problems. It said the BRT lane caused chaos because it was in the middle of the road and people wanting to board the bus had to cross the busy road to get to the bus stops. 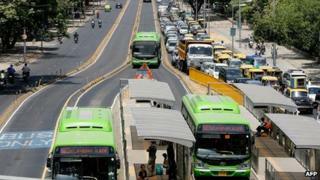 The CRRI said that 71% bus users wanted bus stops by the side of the road. However, in a hearing last month, the court supported the concept of an exclusive corridor for public transport and asked the government to "find a mechanism to remove the problem to save BRT". But critics said the CRRI study ignored the version of bus users and relied only on what the car owners had to say. The head of the Centre for Science and Environment (CSE), Sunita Narayan says the study glosses over its own figures. "Cars use more space; crowd the road and move far fewer people. The problem is that people do not matter in our cities; cars do. In this situation, BRT becomes the hate symbol while people waste time in traffic jams," Ms Narayan wrote in the latest issue of Down to Earth magazine. Commentators say the whole debate over private versus public transport reflects the mindset that believes in the great social divide that has existed in Delhi since the Moghul period. Prof Pushpesh Pant says the debate manifests the class divide in a status-conscious city where a car is considered more of a status symbol than a convenient mode of transport. Mr Sharan, the man spearheading the campaign against the BRT, dismisses the argument. He says those who travel in their own cars are the decision-makers, therefore, they should get a priority over buses. He believes that bus users can wait because they are engaged in less important jobs. "You cannot keep a commander-in-chief waiting in traffic while his army is waiting for his orders. How does it matter if a peon reaches office five minute before time?" Mr Sharan asks. But what about those who travel by buses? Salman, a young technician from Bihar, is part of the huge workforce that depends on the public transport to get from one place to another. He says it is not fair to give preference to car users. "It is more important that we reach the office on time rather than the employers because we are the ones who do the work, not them," says Salman. Another bus commuter, Avinash Chaudhary, is bitter about the whole debate. "Car users are generally big officials or influential people. Nobody is going to mark them absent even if they reach office four hours' late. But a daily wage earner, who gets 150 rupees ($2.70, £1.70) a day, is marked absent if he doesn't report for work on time. India belongs to rich people only," he says. Meanwhile, the petitioners say they will continue to contest the case till the very end because they think the car owners in Delhi are being treated unfairly.